*Production speed up to 140sqm/h. *Maximum 1000m media load. *Inflatable take up and feed media shaft enables stable media roll loading. *Integrated IR & cooling fan system shorten drying time even in production speed. *Integrated IR & cooling fan system shorten drying time even in production speed. *Heavy-duty scan motor and feed motor ensures long term stable printing. *Ink level sensors will ensure normal printing. 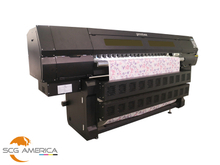 GD3200AE large format inkjet printer is applied in advertisement, digital textile printing, leather transfer, home decoration wallpaper and etc.. It’s designed with Epson DX5 print head, the best controlling system in China and excellent structure to get the best printing performance and ultimate printing speed. We are dedicated to strictly select materials to supply our customers with best support and cost performance. 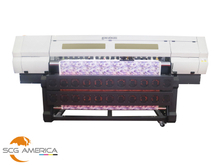 The Grando AE1800-TX2 is an exceptionally advanced direct to garment printer designed to create high quality printing at an oustanding production speed. 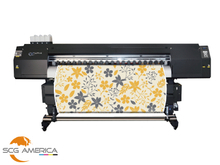 It features the latest technology to meet the growing demands of textile business. 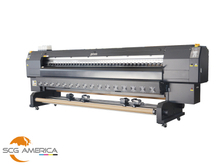 The Grando AE1800-TX2 includes a reliable media feeding system. The combination of tension bars and drive rollers allows to maintain the proper tension for a smooth and stable textile transportation. 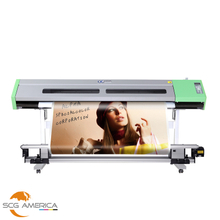 along with its variable ink droplet function creates an exceptional image quality.